The double hung window style has two sashes that operate vertically for ventilation from either the top or bottom of the window unit. Both sashes may tilt in for safe and easy cleaning from inside the home. Balancers counter the weight of the sashes to provide easy operation and to allow the sashes to remain open in any position. Window Source Of Springfield knows that windows are a very important part of any home or business and that is why we make it our business to provide you with high quality replacement window installation services. You don’t have to sacrifice on quality if you’re working with a limited budget on your replacement window project. Our economical 3000 Series double-hung window line has all of the essential features of an energy efficient replacement window line including fusion welded frames on all sash and mainframe corner joints. 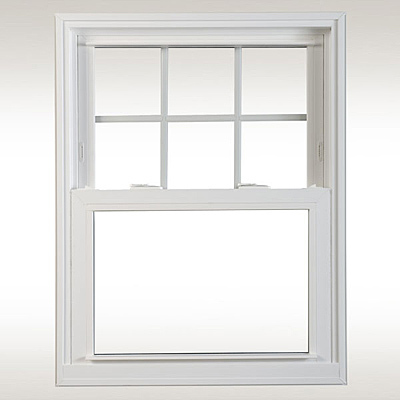 Many other entry level windows have mechanically fastened joints that can work loose. Many homeowners upgrade to our popular 6000 Series double-hung window line. The 6000 series comes standard with more vinyl, more strength, and double strength glass. For just a few dollars more it is a great value. The 9000 series is our highest performance window line. Triple glass and foam filled frames give you the ultimate in comfort and energy savings. The triple glass package in the 9000 series features two coatings of high performance LowE and two chambers of Argon gas fill. The result is a highly efficient replacement window with an incredible NFRC U-factor of .22 with Energy Miser 2+ glass. With the 9000 series you’ll be prepared for ever rising energy prices. We have seen similar products offered for more than twice as much. Why pay more?